Jeremy Striffler applies the concept of tribal culture to CrossFit and examines the five stages of the CrossFit tribe. On a crisp, cold Saturday morning in early December, I showed up at TwinTown CrossFit in Minneapolis, Minn., to participate in the preliminary round of the Winter PR Challenge. 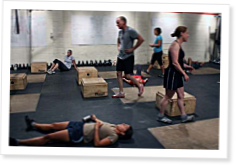 The sight of 30-plus members of the gym preparing to do the CrossFit Total welcomed me. For close to three hours, our group cheered each other on as we made our individual attempts at each element. A countless number of personal records were achieved, and the atmosphere was fun and celebratory and transcended any other experience I have ever had in the past at a gym or on a sports team. I was overwhelmed by the group’s commitment to each other’s success, which seemed more paramount than any individual worrying about his or her own accomplishments. What I had suspected over my past six months since joining the gym was finally confirmed that day—we are a tribe. Craig Nelson asks us to take a break from Eminem and DMX to try a WOD with the OGs of music: Brahms, Bach and Tchaikovsky. Great article! I love the concept of a "tribe" versus a "cult"! Much more appealing! Thanks Jeremy, well done, excellent reference, I look forward to reading it.